Apologies in advance as this is a double post in the Vegas section as well. Figured it was of interest in both which is why I did it. Got my PAL XH-A1. Did some test shots in 50i and 25f with a view to comparing. So...wihin Vegas, 25f doesn't seem to be an option? Anybody know any different or a workaround? Alastair, I have simply created and saved my own template as attached. Thanks for the quick reply. Youve answered my question but raised a few more. I thought the templates that were shown were all that was available? Can you literally tell Vegas to handle whatever you throw at it? You can stat with any template, set your own values in the fields and choose whatever you want from the drop-down lists, and then save it a s your own template under a name of your choice. As to the width, yes - 1440 is the HDV standard, just like the Pixel aspect ratio of 1,3333 (which will give you the 1920 to watch). I'm still on the learning curve and you have helped steer me through one obstacle. So.....when and for what would you use the 1920 x 1080 template? I'll post this here as well, as it's the natural next question. 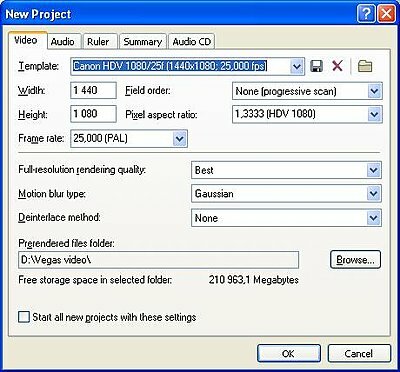 OK, now I have my project properties correct, and, assuming I was wanting to print a HDV master back to tape, what render settings would I choose for 50i and 25f? I tried rendering as MPEG 2 DVD Architect PAL and the 25f looked fine. The 50i didn't look right at all. Seemed to have horizontal striping across the image. Alastair, sorry I lost your questions because the thread has been moved. The horizontal "striping" you see is probable interlace artifacts; if you deliver to a DVD to be played in a progressive DVD player (or feeding a progressive TV, or both) - this is not a problem as it'll get deinterlaced. If you mainly intent to watch your movies on a PC, you better use the F format!